STRUMIS LTD is delighted to announce a partnership agreement with Hypertherm Inc, of Hanover, NH, USA. Hypertherm Inc is internationally renowned for its commitment to designing and manufacturing the best industrial cutting solutions on the market, dating back nearly 50 years. Their sole focus is cutting! Hypertherm's mission is to provide customers with cutting solutions allowing them to "cut with confidence”. STRUMIS LTD is the leading supplier of software solutions to the international structural steel industry since 1986. With core business areas in the construction and structural steel industries, STRUMIS products have consistently transformed its customers business in the steelwork fabrication supply chain. 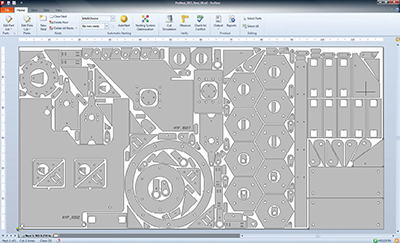 As part of the recent partnership agreement, Hypertherm’s latest ProNest CAD/CAM nesting software version can now be linked with the latest version of STRUMIS to provide API data- exchange functionality, which will complement STRUMIS’ existing linear nesting, and in exactly the same way as linear nesting, will allocate/nest plate mark items from inventory or supplier available sheets. The additionally required sheets will then be added to the purchase order automatically and any remnants/off cuts returned to inventory. DXF and NC export files will be forwarded to the relevant plate profiling machinery within the STRUMIS Production Control module to complete the process. This significant new functionality will deliver substantial benefits to mutual users of STRUMIS and ProNest in terms of both maximizing materials and minimizing wastage, together with integrated production processing through CAM/CAD technology. At Hypertherm, our sole focus is cutting. Every Associate – from our engineers to our manufacturing and service teams – is completely focused on providing our customers with the best cutting solutions in the industry. It’s a mission stretching back nearly 50 years to our first industrial cutting patent. Today, our patent wall continues to expand as we innovate tirelessly to introduce new plasma, laser and waterjet technologies and services that will help you achieve optimal cutting outcomes that support your business objectives. So, whether you’re cutting precision parts in North America, constructing a pipeline in Norway, fabricating agricultural machinery in Brazil, gouging out welds in the mines of South Africa, or building a skyscraper in China, you can count on Hypertherm. No matter what you cut, where you cut, or how you cut, we are here to guide you toward the cutting solution that is right for you. ProNest is an industry leading CAD/CAM nesting software for advanced mechanized cutting. It provides a single solution for all of your profile cutting needs, including plasma, laser, waterjet, and oxyfuel. It is specifically designed to help fabricators and manufacturers increase material savings, boost productivity, lower operating costs, and improve part quality. Brought to you by the cutting experts at Hypertherm, ProNest allows you to leverage breakthrough cutting technologies like True Hole® and Rapid Part™, which are delivered automatically without operator intervention, and True Bevel™ which greatly reduces bevel set up time. Additionally, ProNest does more than any other nesting software to automatically embed cut process expertise into the NC code, making it surprisingly easy to learn and use. STRUMIS LTD is a leading developer of software solutions to the international structural steel industry since 1986. With core business areas in the AEC Building and Construction industry, STRUMIS LTD products have consistently transformed its customers’ business in the steelwork fabrication supply chain. Our products include BIM project collaboration and fabrication management software. STRUMIS LTD has international sales, training and support operations in 10 countries. STRUMIS is an all-encompassing steel fabrication management information system that harnesses the information flow and work processes through the steelwork contract between departments, suppliers and clients; from estimate tendering, through procurement and production and into construction. STRUMIS steel fabrication management software is for engineering and fabrication companies looking to implement a dedicated fabrication management information system to manage across a workshop and all departments including multiple sites, or even across supply chains.